Knotty pine vaulted ceilings and unobstructed pine wood views let you relax in style in our family friendly original 1940's duplex cabin. Nestled under towering pines and backing up to a National Forest meadow the cabin is located behind Tahoe Keys, along the bike path and a few miles to Tahoe Keys beach and Camp Richardson. This is a personal, fully furnished, private, vacation home that sleeps 7. The cabin has 2 bedrooms, 1 bath, kitchen, laundry room, and private backyard. The kitchen is complete and fully stocked with cookware & serviceware. 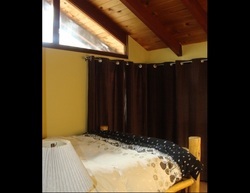 The cabin is WiFi and the living room is equipped with a flatscreen HDTV & PS3 gamestation. The bedrooms all have rustic pine log beds with euro posturpedic mattresses and are fitted with high end duvet comforters. The rustic pine log furniture is hand cut, pealed, and carved original home furnishings. The artwork is all original fine art. The bathroom is supplied with white bath towels, hand towels, and bathroom essentials.